This Merry Christmas card is a happy holiday greeting to send to friends and family. Make sure to say "Merry Christmas" to everyone near and dear to you using this printable Merry Christmas card. Your child can also use this Merry Christmas card to practise his Handwriting skills, as he writes a special message inside of each card. Print this Merry Christmas card this holiday season. This Merry Christmas coloring page is a a simple activity for a winter afternoon. 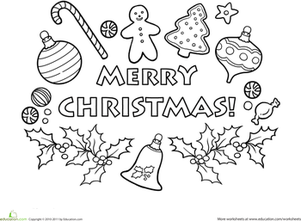 colour this Merry Christmas coloring page with your child this holiday season. Get ready for some merry maths practise this Christmas! Santa has left lots of colorful presents filled with simple addition facts. Merry Christmas! To help your child stay sharp during the holiday, Santa has left lots of colorful presents filled with addition facts for your child to solve.